Compared to other beers (like lambic, grisette and Bière de Garde), I haven't said much about historic saison on this blog. So it's probably time I do a bit of that. Two fairly complete recipes are given for "bières de saison" in the Q&A sections of the 1905 Petit Journal du Brasseur. In both cases, the brewer describes their process in detail and asks for advice on this proposed process to make these beers. One of brewers wants to brew by infusion and the other by a form of turbid mashing. On the whole the recipes have similarities but I think it is worth presenting both in full as the two give a good idea how brewers were approaching these beers at the time - both in their similarities and their differences. 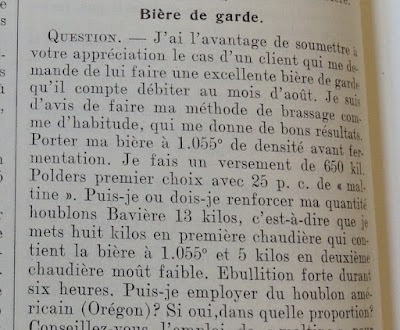 Question about a bière de saison in PJB 1905. In this first post I'll address the infusion recipe as well as some background/context, with the turbid mash recipe and some comparison saved for the second post. Though the breweries aren't named, from the publication and the text it is clear that these are somewhat industrial brewers rather than the rustic farmhouse notion of saison (in the same way that modern saison breweries are generally not really farmhouse breweries but industrial breweries, some of which happen to be around farms). In that sense though, I think these recipes show an important point in the history of saison. They come at a time when the beers were still brewed in the winter and served in the summer and were still mixed-culture beers, but also when the beer had moved to commercial breweries as a component of their production instead of the lore of an off-season brew at a farm. So in that way they offer a point of connection between modern saison and the origins of saison, and they may fall close, in spirit at least, to the modern mixed-culture saisons. I feel like I should also say something about the use of the term bière de garde here (although I've also discussed this in other posts recently). Both brewers call the beers they want to make a bière de saison and then clarify in parentheses a bière de garde. Bière de garde is used in a general sense here to mean a beer for aging, with bière de saison being a bit more of a specific name, but this shows the fluidity of both of these names for Belgian beer at the time. With that said, the recipe, process and advice given for these beers is quite similar in many ways to the sort of considerations taken when making Bières de Garde from the north of France. These recipes both use "Escourgeon". I've talked about this elsewhere and it shows up in other places such as the saison history chapter of Farmhouse Ales. If you are unfamiliar with this grain, it is winter 6-row barley. In the 1800s and early 1900s Belgium was growing and using 6-row barley more or less exclusively. Escourgeon is frequently the recommended barley for beers for aging, though it may have been harsher than spring 6-row barley in younger beers. Within Escourgeon there was also a hierarchy, with certain regions preferred over others. In general, Escourgeon would have had a higher protein content than modern grains. With proper malting and mashing, this would mean more darkening (and the sort of flavor development that goes along with this) in kilning and boiling. One final general point about these recipes - neither one of these recipes discusses the flavor profile of the finished beer or if the fermentation was "pure culture". But, given the time and the nature of beer (ale fermentation), they were likely mixed culture beers. What exactly that means would have varied from brewery to brewery, but it likely included some atypical Saccharomyces strains or non-Saccharomyces yeasts (so possibly Brett and/or other yeasts that you might find in other Belgian mixed culture beers) as well as the potential for bacteria. Both beers are reasonably hopped - around or above modern lambic levels (though this is not really a good comparison as one case deals with fresh hops from 100+ years ago that may not grown anymore and the other deals with aged modern hops). Brasserie à Vapeur, can lose a lot of heat. It is possible that in the time scale of around 5 months, some bières de saison may not have developed a lot of acidity. But I would guess that many would have, given acidity in other comparable beers like Bière de Garde, other discussions in PJB about acidic saisons and PJB discussions about customer taste preferences. So, for the modern brewer looking to brew something based off of this, using a mixed culture with multiple yeasts as well as lactic acid bacteria would be a good way to go. Hops from Poperinge - 3.1 kg per 100 kg grain, ~450 g/HL wort pre-boil. The varietal is not specified. Hopping is discussed below in more detail. Mix water at 60-62° C (140-143.6° F) with the grain reach 52-55° C (125.6-131° F) in the mash tun. Mix for 20 minutes and then rest for 10-15 minutes. Infuse with water at 90° C to boiling to raise the temperature to 70-71° C (158-159.8° F). Rest 1.5 hours. Collect wort from the initial saccharification rest into the boil kettle. Infuse with water at 76-85° C (168.8-185° F) such that the mash temperature remains at 70-72° C (158-161.6° F). Mix for 20 minutes and then rest for 30 minutes. Collect wort from the second saccharification rest into the boil kettle. Sparge with water at around 75° C (167° F), or perhaps slightly warmer. The old Brasserie Dupont mash tun. There are some general things to keep in mind with this info regarding the temperatures of the added water and the resulting mash temperatures. 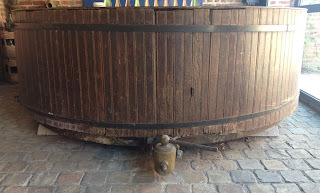 A typical mash tun of the time would have been an open-topped iron mash tun with an aspect ratio sort of like a hockey puck or tuna can rather than something with closer to a 1:1 width to height ratio or more like a soup can (as is more typical of modern equipment). These ~1900 Belgian mash tuns could have lost a good deal of heat over the course of a mash rest (possibly around 2° C / 3.6° F per 30 minutes as mentioned in this post). Additionally, the infusion water is heating both the grain and the thick iron mash tun, and the latter would take a lot of heat to warm it up compared to modern equipment. Therefore, attempting to mash like this on a home scale or with modern commercial equipment might require some adjustments of the infusion water (smaller volumes or cooler water). As noted above, the hops used in this recipe came from the Poperinge region, one of the two main regions of historic Belgian hop growing (and the main region for modern-day Belgian hop growing). The landrace Belgian varieties grown at this time (e.g. Coigneau, Buvrinnes / Tige Vert / Duitsche Hop / Tige Allemande, Groene Bel / Cloche Vert, Tige Blanche / Witte Ranke, Tige Rouge / Roode Rank) have more or less disappeared, though some varieties have been re-discovered and are seeing small-scale cultivation starting up. Belgian hops were believed to be a bit less potent than contemporaneous German and Czech hops (for a bit more info comparing hops from different regions in the late 1800s and early 1900s, see the table in this blog post), and it is also likely that advances in hop farming could result in higher alpha acids in modern hops than historic hops. For the modern brewer, landrace French hops may be a good choice, or German or Czech hops at a slightly lower hopping rate than the one quoted here. The final volume isn't noted in the Q&A so I'm not sure exactly what the final hopping rate would be in terms of g per HL. Based on the pre-boil volume given (45 HL) and the process (5 hour boil, maybe cooling in coolships or maybe not), and similar modern breweries (lambic brewing) I'm going to estimate that this is roughly 530 to 630 g per HL of wort in the fermenter, depending on if a coolship is used or the wort is force-cooled. The old (and long out of use) coolship at Brasserie à Vapeur. Yeast was pitched when the beer was 21° C / 70° F (nothing is said about the method of cooling, but coolships or a cooling system like a Baudelot chiller would have been appropriate). It sounds like fermentation at this specific brewery took place in a metal tank - perhaps something like what is shown below. But the beer was then aged for around 5 months, likely in wooden barrels. Here is an approximation for adapting this to modern ingredients and at homebrew sizes. Feel free to make your own adaptations from the historic recipe. I haven't yet tried to brew something like this myself, so this is a theoretical recipe and could have some kinks to work out. Open fermentation in a metal tank at De Dolle. 4.1 kg (9.0 lb) Continental European Pale malt. Go for something like Dingemans, Chateau, or Soufflet/Franco-Belges if you want a bit more color or something like Weyermann and Best is you want it to be a bit paler. Mash: This follows the mash above, but you should probably rerun the infusion temperature and volume calculations as this could vary a bit based on your system. Keeping extra boiling water and extra cold water on hand in case you need to quickly adjust the mash temperature is probably good too. I think this is good in general, especially with new or complicated/strange mash schedules. Mix grain with 7.7 L of water at 60.6° C (8.1 qt at 141° F) to reach 53° C (127.4° F). 10 minutes total for adding the water and mixing. Rest for 20 minutes. Slowly infuse 8.1 L of water at 89° C (8.6 qt at 192.3° F) to reach a mash temperature of 70° C (158° F). Take 10-20 minutes for the rise, so maybe add the volume in small steps rather than all at once. Rest for 1.5 hours. This step could probably be shortened a bit with modern conditions. Drain the mash into the boil kettle. Keep this wort on low heat (intermittently if necessary) so that it stays between 75° C and boiling. I'm guessing the volume in the boil kettle should be around 12.4 L (3.25 gal) based on a grain absorption of around 4.2 L (~1.1 gal) and with a bit of extra wort remaining behind from false bottom dead space, etc. The remaining calculations are based on this figure. Infuse with 15.5 L at 71.7° C (16.4 qt at 161° F). The total time for the addition and mixing should be around 10 minutes. The rest for 30 minutes. This step could also probably be shortened with modern grain/equipment. Drain the wort and sparge (fly or batch, as you prefer) with water at 75° C (167° F). Boil: 5 hour boil. For me that would mean starting with about 42.6 L (11.25 gal) assuming 3.8 L (1 gal) per hour boil off and 3.8 L (1 gal) loss to trub. Begin heating to a boil after the second mash wort is collected or, if fly sparging, shortly after you begin sparging. First wort hop: 20 g, split evenly between hops added after the first wort is collected and once the wort from the second mash is collected. 40 g hops after 1 hour of boiling. 40 g of hops after 4 hours of boiling / with 1 hour left in the boil. Either chill by using your boil kettle as a coolship or as you would normally chill your wort. If you go the coolship route this will likely change the extraction from the hops. If you have another kettle/vessel to use as a coolship then you could transfer off the hops into that when you begin cooling. Fermentation: Pitch a mixed culture that you like including multiple yeasts and bacteria. I tend to keep around dregs of various commercial beers that I like along with a saison strain and some brett isolates/blends, so I'd probably use a combination of these (e.g. a saison strain or two that I like co-pitched with a brett isolate or brett blend that I like along with the dregs of commercial barrel aged saisons and/or lambics that I like all together for primary). Pitch the yeast around 20° C (68° F) and let free rise, or possible help it rise. The exact profile you follow will depend on which saison strains you choose. Age for about 5-6 months, or until gravity is stable and you like the character. I see no reason to rack to a new vessel for the aging, so I'd just leave it in the primary fermenter if your primary is fairly air-tight (glass or stainless). Wood would also be fine if you have a good barrel, though I'd lean toward larger barrels if you go this route. I know small barrels can work out well for some, but I've tasted a lot more disappointing beers from small barrels (too much oak/barrel character or too much O2) than good ones. Then bottle (or keg, if that's your preference - I'm partial to bottling), keeping in mind final gravity stability to avoid over-carbonation problems. Part 2 of this, with a turbid-mashed saison recipe, is now up. You can find it here. Amazing post as always Dave! I'm wondering if the hops in this type of historical saisons are "fresh" or aged. As a side note, just want to say thank you for all this work. I enjoy a lot reading your blog, even though I'm far from trying my hand on historical brewing. Greetings from Chile! Thanks Johann! The hops here were fresh (not wet hops, but hops from the most recent harvest). Hey Dave! I just wanted to let you know that I'm brewing the homebrew interpretation recipe today. What is the historical significance of the 5-hour boil? Was it to increase OG, improve melanoiden production, or something else? I am considering just doing a normal 1-hour boil, but I'm willing to extend it if there are benefits. Cool, let me know how this goes! A long boil shows up pretty frequently with historic Belgian and N. French brewing, so that's more of a regular feature across many different beers than a specific unique feature of this one. Yeah, I think you've identified the main reasons. I'm guessing this was partly done based on the brewing styles. Sparging may have been carried a bit further (as it still is with lambic) so compared to more modern brewing, a longer boil may help to reach the same FG. It definitely leads to more color and flavor development as well (as you note). This is something that could perhaps be addressed with changing the malt bill, but I'm not sure the exact same endpoint would be reached. I've not had beers with shorter boils that taste like some 4+ hour boils, but that could just be that I haven't had the right beers. One final point is that a significant portion of the hops would be in the boil for the full time, and the hop character is going to be a bit different between a 1 hr and 5 hr boil. I think you would still make a reasonable beer with a 1 hr boil. It would be a bit different, but maybe you'd like it better with a shorter boil anyway and/or it would make more sense for your setup/constraints/time available (which would certainly be different from a Belgian brewer 100 years ago). So don't feel obliged to do the 5 hr boil. But a long boil would have been the norm for saison (and other beers for aging) historically in Belgium. Thanks for following the blog and for the questions!